We’ve got some frightfully good faculty development offerings for October 2016, so get in the spirit and sign up for one of our faculty development sessions! Does working with groups in Blackboard leave you spooked? Are you unsure about how to use wicked wikis? Do you wonder what the trick is to blogs and journals? If so, then you are in for a treat! SHSU Online is proud to offer a brand boo fully-online faculty certification course: Building Online Communities (Starts 10/3). More Spooktacular Faculty Development Offerings! 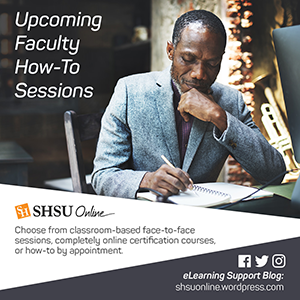 Did you know there is a one-stop shop for faculty when it comes to resources you need for Blackboard and SHSU Online? The Faculty Central tab in Blackboard provides gateway access to several important resources for SHSU faculty who use Blackboard to teach online, hybrid or face-to-face courses. From a Request to Offer a Course Online to the Technical Evaluation & Rubric, this section of the Faculty Central’s main page has the forms you need. There is also a section containing Correspondence forms for those SHSU faculty acting as graders. Can’t find the e-mail we sent you from this or last month’s newsletter? That’s okay! We provide a window into our newsletter via the SHSU Online Newsletter module located on the Faculty Central main page. The module contains links as well as a quick preview of what each article covers. The Faculty Development sub-tab in Faculty Central is a great way to see the kinds of technology how-to sessions and delivery methods that we offer SHSU faculty and staff. It contains not only a link to our session sign-up page, but information on all the sessions that we offer, and how to sign up for a one-on-one appointment. Were you interested in finding out more about SHSU Online’s certification series. This Faculty Central sub-tab provides in-depth information on each of our 5 fully-online faculty development certification options. Would you like to take your team, department, college through any of these? We can set up a certification course specifically for you! Connect with the SHSU Online Support Desk via phone, e-mail or chat by clicking this Faculty Central sub-tab. Remember if you have a technical question, need some assistance or just want to check-in, we are here to help at a time that fits your schedule. Need to know who your instructional designer is? Want to reach out to our faculty development team or the Blackboard administrator? Select the Contact Us sub-tab on Faculty Central and you can get the extension or e-mail of the person you need.